The Conference for Time Sensitive Networking and Applications kicked off with a keynote by Michael Johas Teener, the chief architect of Apple’s Firewire technology, and chair of the IEEE Time Sensitive Networking Task Group. I’m pleased to report that the next generation of AV networking standards are alive and well, and very much here to stay. Sure, plenty of you naysayers still exist out there, but fresh off the AVnu Alliance’s debut conference on Time Sensitive Networking and Applications (TSNA), I can attest to the sold out, standing room only attendance of bright eyed and engaged participants eager to learn the technical nuances, applications, and deployment tricks of time sensitive networks. It’s really all part of IEEE’s ethernet standard, which is constantly evolving. With TSN, the focus has broadened, as the AVnu Alliance has expanded with distinct market segments: pro AV, automotive, industrial, and consumer. AVnu is looking to provide the common foundation, a service layer of sorts to digital infrastructure. The TSNA conference balanced technical sessions with technology demos and dynamic networking to better cultivate a community. One of the biggest goals of the TSNA conference was to cultivate a community. There really is a large contingent of volunteers working on these standards, but putting faces to the process has been missing. 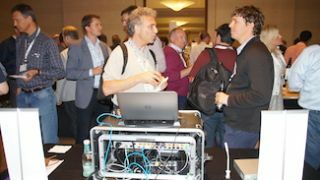 While most of the attendees were engineers—the two days packed with technical sessions were an alphabet spec soup—I did manage to track down an integrator, David Boller, sales engineer at AVDB Group. He heard about the conference, and his boss was thrilled when he said he was interested in attending. Boller felt that other integrators should absolutely have the TSNA conference on their radar in its next iteration. Through the community, all these different market segments have found a surprising amount of common best practices to share. “The thing that’s been amazing to me as I’ve learned more and more about the needs and use cases within the AV market is how markedly similar actually they are,” Walter said. In terms of the public perceptions in the AV industry, Prothe points to the Gartner hype cycle. It refers to the bold promises a new technology always makes and looks to distinguish what’s commercially viable from the hype. There was a whole lot of hype about AVB, which leads people down to “the trough of disillusionment,” which is where the “AVB is DEAD!” type of people live. By Gartner’s model, the cycle peaks, hits the trough, then proceeds through a slope of enlightenment, then a plateau of productivity. One problem AVnu has faced is that there hasn’t been a consistent, dedicated champion and cohesive message—a gap that Prothe is looking to fill. He plans to help AVnu be more vocal about TSN in the AV community, and secondly, get some more content out to the masses via case studies and other material. He expects a whitepaper on open standards and why they matter to be out soon. Focusing on InfoComm and AVnu’s presence there right now is top of mind. The alliance will have some educational presentations and showcases of the AVB ecosystem. Prothe was just recently appointed chair of the pro AV segment, so his mission at the TSNA conference was “to be a sponge,” getting to know all the players better, what their pain-points are, and get a better understanding of the whole picture. The fact that TSN isn’t just about the AV industry is justification for its success and why this industry should care. “There’s a lot of other people doing work on this platform, which is going to ensure that it is scalable and future-proofed,” Prothe said. “This is real viable; it’s real, it’s tangible, and the fact that all these other people are working on it, should give [the AV industry] confidence that it’s a technology that is evolving and is not going away. That’s the AVB is not dead argument.”Lindsey M. Adler is editor of SCN. Follow her on twitter @lindseymadler.